Michelle Obama and Jimmy Fallon turned the White House into a playground to promote the first lady's "Let's Move!" fitness campaign. Mrs. Obama and Fallon faced off in a fitness competition that included push-ups, hula hoops, dodgeball and tug-of-war. In the climactic potato sack race, the first lady came out on top of the "Late Night" host. 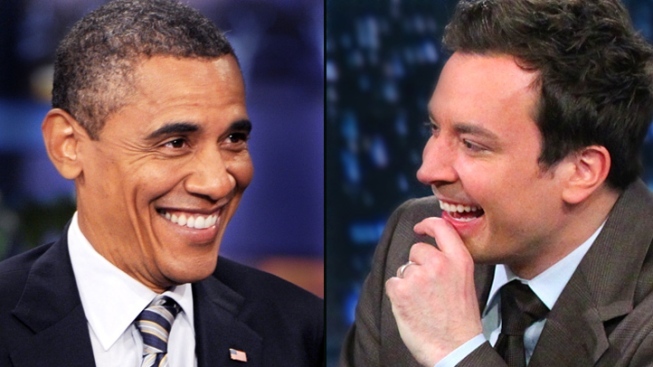 Fallon, ever a gracious loser, commented, "It doesn't matter if you won or lost." The first lady disagreed. "It matters," she joked. The segment was taped last month and aired early Wednesday on NBC's "Late Night." Mrs. Obama has been making the talk-show rounds to celebrate the second anniversary of her campaign against childhood obesity. In the past few weeks, she has appeared on "The Tonight Show With Jay Leno," ''The Ellen DeGeneres Show" and "Rachael Ray."